Francis Ford Coppola is best known as the six-time Oscar-winning director, writer, and producer of such epic films as the Godfather trilogy and Apocalypse Now. As a writer, director, producer, and technological pioneer, Coppola has created a body of work that has helped to shape contemporary American cinema. He has been making films for more than fifty years and wine for nearly forty. In 1975, Francis and Eleanor purchased part of the historic Inglenook Estate, including over 1400 acres of land and founder Gustave Niebaum's Victorian home and carriage house. Coppola renamed the estate Niebaum-Coppola and in 1978 produced the first vintage of Rubicon. 1995, the Coppolas purchased the remaining part of the original property, which included the Inglenook Chateau and approximately 90 acres of vineyards, thus restoring the Estate to its historic dimensions. "In America, so few things that are broken apart are ever put back together. Reuniting this property was truly a dream come true, both for my family and for Napa Valley." The Coppolas restored the Chateau and grounds to grandeur, making it one of the most beautiful visitor destinations in the Napa Valley. Francis Ford Coppola has always been a dreamer, but he is one of those rare people who, with passion and commitment, has turned his dreams into reality. His dreams and interests have not only have involved cinema and wine, but have encompassed food, literature, and travel as well. 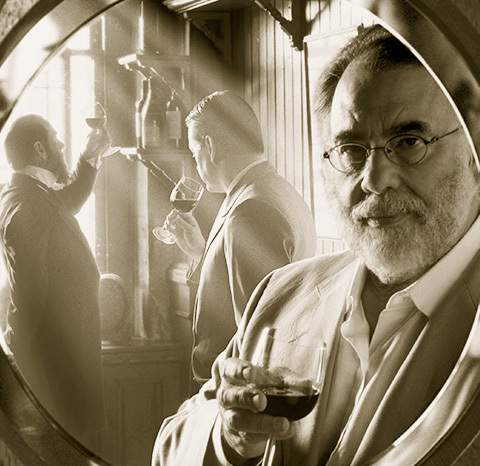 In addition to Inglenook, Coppola also owns the Francis Ford Coppola Winery in Geyserville, California. He launched Zoetrope: All-Story, a quarterly magazine of short fiction, which has won every major story award, including two National Magazine Awards for Fiction. He founded Blancaneaux Lodge, a deluxe, small hideaway in the remote rainforest of Belize and then opened two more Central American hideaways; Turtle Inn in the Belizean beachside town of Placencia, and La Lancha aside Lake Petén Itzá in Guatemala. All three hideaways regularly appear on the 'Best Resorts' lists of travel magazines. Coppola's culinary projects include his Mammarella’s brand pastas, pasta sauces and oils as well as a restaurant, Cafe Zoetrope in San Francisco. In 2012, Coppola returned to his roots, opening Palazzo Margherita, a small boutique hotel in the Italian town of Bernalda, where his paternal grandfather was born.